Can this be true?? If it is it’s one huge step for TVXQ!! Music Station is one of the biggest music programs in Japan, if not the biggest, and if they are on the show it really gives them some evidence that they are popular in Japan. Ok they are there to sing with Koda but it’s still a big thing. Thing is now, the picture says that TVXQ will come along with Koda but the offical site dosen’t. But someone said that BoA once came with someone even though she was not written down on the site. But then someone said you can’t be sure with Music Station because they deside in the last second about the guests. This makes my head spin haha. But I really hope they come.. Some rumors says that they will be They will be on the show Utaban too with Koda. It has been updated on their offical website. I wonder if they will just perform or they will have a chans to talk to. Anyway, that’s quite a big deal too becuase one of the hosts are from Johnny’s entertainment, SMAP. And from what I see Johnnys and TVXQ are big rivals. Rumors says that ever since “Lovin you” Johnny have been keeping an eye on TVXQ and he is the reason that they have not been on Music Staion earlier.. Well well. God, I hope they well be on both shows!! just so you know: MOST OF WHAT I HAVE WRITTEN HERE ABOVE ARE JUST RUMORS!!! There have been alot of talk about TVXQ lately, all around the world! Ok, maybe that was a little much. But they have been on the news in several countries since the news service Reuters did a report on them. Reuters provides wuith news from all over the world to all over the world so thereby the could be seen in, for example, Italy, France, Spain, Peru and so on and on. I have read the article and I have seen the news but I can’t really understand what it was about haha. I don’t understand why they did the report but I guess it dosen’t matter, they were seen on TV in other countries than asia, and that’s a great thing, even though it wasn’t 100% correct with the information^^! One thing I’m worried about is the fact that the boys are so overworked!! I’m really scared for thier health! PS. 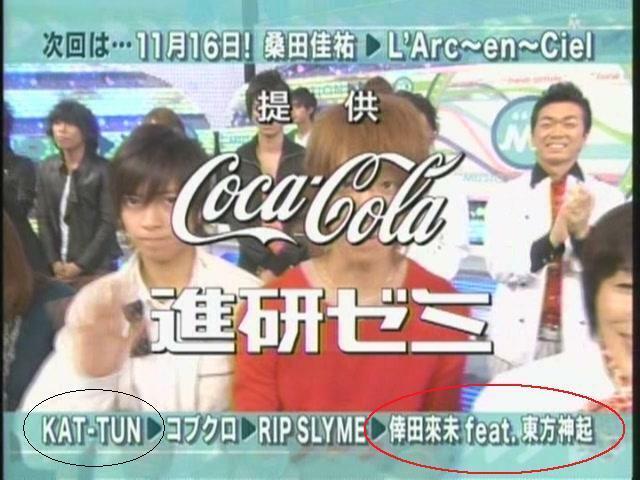 The picture is from the Music Station that was yesterday and News were there. And they are another group of boys I’m worried about lately. Specially Tegoshi and Yamapi. They are both losing alot of weight and Yamapi had huge bags under his eyes as you almost can see in the picture! ´When will all my boys get to rest..